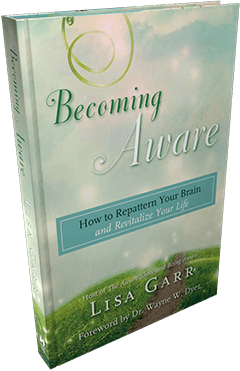 Lisa Garr - The Aware Show - a resource and a catalyst to empower positive change in people's lives through awareness, consciousness, and brain science. Join Lisa Garr on Being Aware on Hay House Radio, Lisa’s Inspirations on Gaia TV and on The Aware Show on KPFK in Los Angeles and WBAI in New York as she interviews best-selling authors and experts in the fields of natural health, cutting-edge science, personal growth, and spirituality. She is also a regular weekend host on Coast to Coast AM and has one of the largest telesummit series on YouTube. Are you living life by DEFAULT... just drifting through and letting it take you wherever it likes? Or are you living by DESIGN... creating a life that’s in alignment with the vision of what you’d like to be, do, have and give? In this day and age, it’s not a matter of just being healthy and living a healthy lifestyle, it’s also about protecting your body from superbugs. Learn more about my recent guest Dr. Joel Wallach, and his life-changing products at Youngevity, here. Have you been learning about personal development, health, and wellness for a long time but are still not applying it to your own life? Would you like to bridge the gap between learning about improving your life and actually doing it? Join Lisa Garr forBeing Aware, Tuesdays at 2pmPT/5pmET on HayHouseRadio.com. Being Aware is about applying practical tools of transformation to your life through personal stories and interaction with the callers. Each week, Lisa will talk with someone who has overcome a major life challenge or achieved a major success, then Lisa and her guest will coach listeners and help them apply the teachings to everyday life. This is transformational radio in action! The Energy Codes® are a set of principles and practices you can use in your daily experience to tap into your authentic self and realize deeper states of awareness. Tune in to today’s show with Dr. Sue Morter and find out how you can overcome fear and navigate challenging emotions. Stop Being Spiritual and Broke! Author Jennifer Noel Taylor was spiritual and broke, until a shocking tragedy completely changed her perspective on the “law of attraction.” Listen to her story and learn practical guidance as she talks about her book, Spiritual and Broke: How to Stop Struggling with Money and Live Your Purpose. Have you ever pushed yourself beyond your comfort zone and felt that profound sense of accomplishment and satisfaction that came afterward? If it’s been awhile, perhaps now’s the time to stretch! And offering suggestions and processes today to guide you is Emma Mardlin, author of Out of Your Comfort Zone. Mike Dooley’s A Beginner’s Guide to the Universe: Uncommon Ideas for Living an Unusually Happy Life gives voice to his most essential, heartfelt advice about living deliberately and creating consciously. Listen today as he guides us through a range of topics and helps us see that a happy life is within our reach. In case you haven’t heard, bestselling author and spiritual leader Marianne Williamson is running for president of the United States! She’ll be on the show today to talk about her platform and her vision for this country. Tune in and get inspired to support her mission! You hear so much about heart disease these days, but have you ever heard about fibrinogen? Probably not, but it’s important that you know about this! That’s why Lisa is hosting author and medical researcher Christian Wilde on the show today. He’ll tell you all about what fibrinogen is, what the appropriate levels should be, when it’s dangerous, how you get tested, what you can do to bring your levels down and more. This is a very important show! The recording for this show is not yet available. Lisa Garr and Gaia Inspirations is a one-hour interview program featuring leading edge visionaries, spiritual teachers and inspiring innovators who bring you the latest in personal development and mind-body wellness. With a wide variety of thought-provoking guests, you’ll explore ancient wisdom, gain personal insights and learn about spiritual enlightenment. A brand new inspirational season begins October 4th, sign up and watch on Gaia TV! Coast to Coast AM airs on more than 600 stations in the U.S., as well as Canada, Mexico and Guam, and is heard by nearly three million weekly listeners. With host George Noory, and guest weekend hosts such as Lisa Garr, it is the most listened to overnight radio program in North America. Please Subscribe to make a vote for Conscious Media!! Several years ago, Lisa suffered a brain injury during a California State Championship Mountain bike race, cracking her helmet in 13 places. After her near-death experience while lying on the side of the mountain, she transformed her level of consciousness, and rebuilt her brain and her life using specific visualization techniques outlined in this book.